As the number of bars in Hong Kong continue to soar, so do the choice of libations; making the process of picking one’s poison somewhat arduous. Well, fret not and read on for the liquid solutions to your cocktail conundrum. The Ernest Hemmingway-inspired speakeasy (ranked number 5 in Asia’s 50 Best Bars 2018) recently unveiled new cocktails created by top mixologist Agung Prabowo, and we already have our pre-dinner favourite. If you appreciate Bloody Marys, you’ll likely enjoy A Moveable Feast #1964 – a savoury cocktail resplendent with flavours of the sea. A rotary evaporator extracts the essence from clams, seaweed, salts and seawater, which is re-distilled with vodka to provide the base. The clear consommé-esque cocktail is then infused for 24 hours with spiced cherry tomatoes, coconut, basil-tomato seeds and oyster leaf. Perched on top of The Murray, Popinjays offers a vantage point not usually seen this side of the island, lending itself to rather impressive sundowner sessions. The rooftop venue is named after the resident cockatoos that frequent the neighbouring gardens and the avian theme runs throughout. 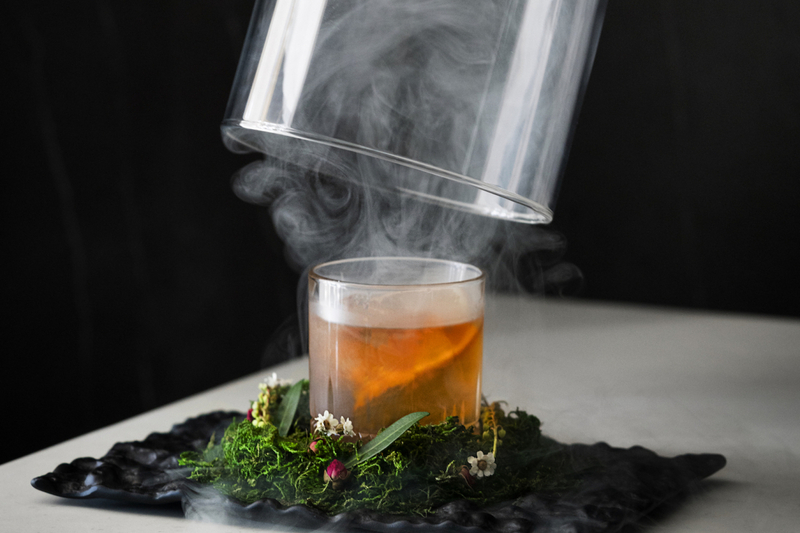 We order Above the Clouds from The Aviary Collection, which blends Zacapa 23-years-old rum with grapefruit and cassia infused angostura bitters. Brought to the table with smoky theatrics, it adds a smouldering smoothness to the cocktail, but ends brightly with lingering notes of rich spices and fruit. This gin gold mine, hidden in The Landmark basement, boasts Hong Kong’s largest collection of gin and continues to expand its menu still. Earlier this month, six new signature gin and tonic prescriptions were revealed and we felt compelled to go visit the doctor. Our chosen elixir: Blind Tiger Gin – a favourite of Dr. Fern’s Head Bartender Paul Chan – is handcrafted gin made in a secretive distillery in western Belgium, supplying a healthy dose of mystery to the liquor. Peppered with hints of spiciness, the cocktail is soothed by the sparkles of Fever-Tree Mediterranean tonic and finished with orange peel, cinnamon and rosemary. The Negroni is an inescapable item on Hong Kong bar menus and adoration for the timeless drink has created a multitude of variations. Keeping us under its intoxicating spell is the Argila (meaning clay in Portuguese) – a negroni with a Brazilian backbone that can be found at Uma Nota. The lively Brazilian Japanese restaurant adds a São Paulo style twist to the classic which also seems to give us the courage for a samba showdown. This deep, earthy-hued cocktail is full of verve and made up of Capucana, a citrusy style cachaça (sugar cane spirit), Mancino Rosso Amaranto Vermouth, Cynar and orange bitters aged in a clay pot. Disguised as a hotel room that requires a keycard to enter, Room 309 is an invitation-only bar on the third floor of The Pottinger. Antonio Lai – award-winning mixologist of Quinary and The Envoy, among others – has concocted eight transparent cocktails for The Invisible Menu in which we have selected the Fluffy Pineapple Martini. The cocktail permeates a vibrant tang of the tropics. Thankfully, it steers clear of sticky sweetness and instead, makes use of science with re-distilled pineapple vodka, centrifuged pineapple juice and clarified lemon juice to create a translucent and refreshing cocktail – adorned with a pineapple crisp and salted egg yolk crumble.